Register early to save your spot; space in the three hands-on workshops is limited to ensure a quality experience. 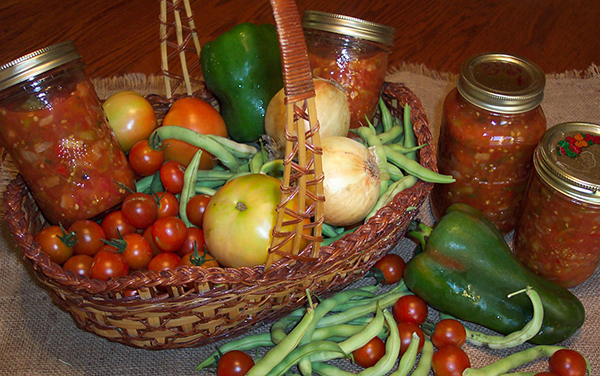 Learn how to turn the local abundance of tomatoes and fresh vegetables into jars of color and flavor for the dreary days of winter. After a short presentation on the basics, teams of no more than four will work together to make and process a batch of salsa from locally grown fresh ingredients. Everyone takes home a jar of fresh canned salsa! Space is limited! With the right recipes and methods, it’s easy to provide your family with safe, nutritious home-canned products. Learn the basics of food safety and canning skills, including bacteria and food spoilage, canning equipment, and canning high/low acid foods. This class is essential for anyone new to the science of canning as well as for those needing an update on the most recent research and changes to home canning procedures. We strongly encourage anyone taking one or more of the hands-on classes to take this class as well. Demonstration of hot water bath & pressure canning, no hands-on. Delight in the bright flavors of fresh fruit and discover how easy it is to capture sunshine in a jar. Learn how to create that perfect balance of fruit, sweetener, and other ingredients to enhance flavor and shelf life with research-based recipes. Low and no sugar recipes covered. After a short presentation on the basics, teams of no more than four will work together to make and process a batch of jam from locally grown fresh berries. Everyone takes home a jar of just-made jam! Space is limited! Crisp, tasty pickles are the ultimate test of a canner’s skill. Learn how to make a great product every time. In addition, we’ll look at the traditional art of fermentation with a hands-on sauerkraut-making session. After a short presentation on the basics, teams of no more than four will work together to make and process a batch of quick pickles as well as a jar of sauerkraut from locally grown fresh cukes and cabbage. Everyone takes home a jar of fresh canned pickles and starting to ferment sauerkraut! Space is limited! Cost is $20 per person per class or register for all four classes by May 15 and get one free (only $60!)! Register online at Preserve-The-Harvest.eventbrite.com or download this form and mail with your check. All in-person classes held 6:30pm-9:00pm at WSU Snohomish County Extension’s Evergreen Room in McCollum Park, 600 128th St SE, Everett. For more information on the classes, contact Kate Ryan, kate.ryan@wsu.edu, (425) 357-6024. Kate Ryan has been canning ever since she learned from her grandmother as a child. Throughout the years, her failures prompted a quest to learn the best and safest methods for home food preservation. When WSU revived their home food preservation training program several years ago, it was the perfect opportunity for Kate to brush off her skills and learn the most up-to-date science and protocols for safe food preservation.